Alita: Battle Angel bursts on the screen with a bang, brings some high-level action and introduces a slightly new take on an apocalyptic future. Director/director Robert Rodriguez teams up with James Cameron (screenplay), and both men have impressive records of bringing strong female characters to the screen. The film works in setting up a new world for us to explore, however, its storyline lacks focus at times and its lacklustre ending may not leave you feeling excited about a follow-up. Alita: Battle Angel is set in a world full of cyber-enhanced humans and cyborgs. 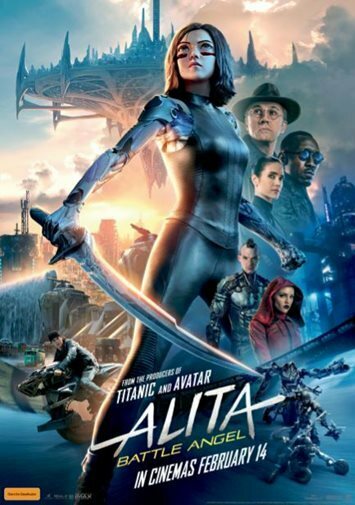 In parts, the film has a similar feel to Ready Player One (2018), however, rather than rely solely on 1980s and 1990s references to fill its runtime, Alita aims to create a functioning world for character development to take place. It also strives to give cinema another strong female action hero, following on from recent efforts such as Katniss in The Hunger Games, Lara Croft in Tomb Raider, and of course, Wonder Woman. Alita is played by Rosa Salazar, using motion capture (in the style of work Andy Serkis made his own). Alita is given a slightly unnatural look, as her character is mostly cyborg. This is a deliberate choice, however, whilst at times she looks very real within the scene with the non CGI characters, on other occasions she feels separate from the visuals, and a little bit like a computer game character. Overall, the effects of the film are effective and the film does deliver on spectacle. Alita of course, is a character with an important, world altering back-story. So naturally she has no memory of who she is, a common plot device (especially this month), and we're introduced to this world through her discovery of it. Naturally, she turns out to be very special, and there is some misdirection about who the good guys are and who the bad guys are. As Alita slowly rediscovers some aspects of herself, she gains more power and starts to target the true villain of the story. From a plot point of view, there isn't a lot of truly fresh ideas here, although the film is trying to act fresh and innovative. The emotional journey of Alita is fairly well presented, and Salazar gives a good performance, however, the 'one special person who can change the world' motif is feeling very stale by this point. In support of Salazar, is the always brilliant Christoph Waltz, this time in a heroic role rather than a villain. However, Waltz's role within the story is somewhat inconsistent in its importance. He isn't given quite enough to do, bouncing from cyber surgeon to crime fighter and father figure and whilst we get glimpses of importance to his character, the story doesn't quite hold together enough for his role to be significant. The third act is the real issue with the film however. It feels rushed and messy. The plot takes a side step, as for two acts the film feels like a self-contained movie, but then instead of following through with the story line established, it switches focus to instead set up a sequel or two. This is a common issue in this era of franchises, as rather than earn a sequel off the success of a story, movies will often start out with the plan to sequel from the start, but not in an organic way for the story line. The recent Fantastic Beasts movies are a very good example of this. Unsatisfying is definitely the best way to describe the moment the credits roll. The film is just artistic enough to forgive much of its short comings, however and whilst it has many familiar elements to it, it is well worth supporting new characters. Hopefully, if the sequel does eventuate, the writing is more focused on that films storyline, and not filling in time just setting up a third film.